The Electra-ride LT stair lift is an older model that is no longer available from Bruno. I've left this information online for anyone looking for information on it. 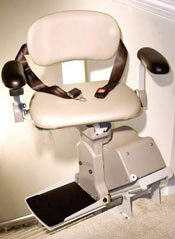 The Bruno SRE-2750 Electra-ride LT Stair Lift is manufactured by Bruno Independent Living Aids, Inc. The Bruno Electra-Ride LT delivers safety, performance and ease-of-use at an economy price. Reclaim your entire home with the newest of Bruno stairlifts. Going upstairs and down has never been so effortless and inexpensive. Virtually everyone can afford home stair lifts like the Electra-Ride LT.
With adjustable seat height and low footrest height, you will be totally at ease on your Electra-Ride LT. Carrying up to 275 lb(125 kg), the unit moves without hesitation when stopping and starting. The standard swivel seat makes it easy to exit when you reach the top or bottom of the stairs. The Electra-Ride LT meets all ANSI A-18.1 residential requirements. Using two 12-volt batteries that are powered by an unobtrusive battery charger plugged into a standard household outlet, the Electra-Ride LT features strip charge contacts for more flexibility when parking. You have access to your upstairs and downstairs, even if electrical service in your home is interrupted. This stair lift offers a long list of standard features at a price that will please the budget-minded customer. Flip-up arms for easy wheelchair transfer.